After upgrading to Windows 8.1 I had issues running Cisco VPN software. When attempting to run I got an error 442. (Note this applies to Cisco VPN, not Cisco AnyConnect.) As a first step in troubleshooting I ensured that I was on the latest version, 5.0.07.0440. Change it so matches what you see above. Some installs have some “gibberish” on the front, this should be removed. In my case it was already set to what you see above, so it was on to the next step. After some more searching and experimentation, I finally came upon a solution that worked for me. Open Windows Explorer, and navigate to C:\Program Files (x86)\Cisco Systems\VPN Client. Right click on the first .exe you find, in my case cisco_cert_mgr.exe and pick Properties from the menu. Switch to the Compatibility page. 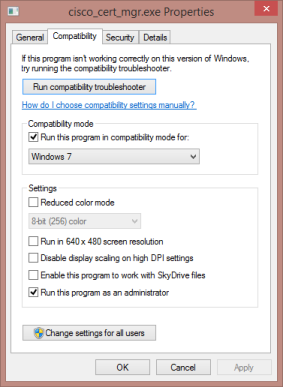 Check on “Run this program in compatibility mode for:” and pick Windows 7. Then at the bottom, check on “Run this program as an administrator. Then click on OK.
Repeat this for every exe in the folder. Unfortunately you can’t apply these in mass, you have to do these one at a time. There’s only a handful though so it shouldn’t take long. After you are done, reboot. 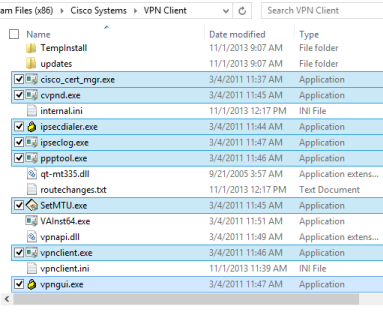 Before you run the VPN software, verify the Cisco network connector is not active by going to Control Panel, Network and Internet, Network Connections and validate the Cisco Systems VPN Adapter for 64 bit Windows is Disabled. Note after you connect this will become Enabled, you just want to be sure it is disabled before you connect. If you see multiple connections for the Cisco adapter, you will need to delete the excess ones, I’ve also seen suggestions to uninstall the Cisco VPN, make sure all the Cisco connections are deleted, then reinstall. I didn’t have to go through this though, so your mileage may vary. Also note that after you reboot, you may see a prompt asking if you want to run the Cisco service as Administrator, naturally you’ll say Yes. Then go run the Cisco VPN client again, confirming you want to run as an Admin, and you should be good to go!